Hanover Shoe Company was founded in Hanover Pennsylvania in 1899 and produced quality, goodyear welted shoes from its factories until 1996. Twenty years after Hanover ended the production of shoes in the USA, Hanover shoes are still sought after by men’s shoe enthusiasts. Hanover was one of the top shoe manufacturers in the USA and produced a wide range of men’s boots and shoes. Like many USA shoe manufacturers, Hanover produced a limited number of premium models using Horween Shell Cordovan leather. Below I have started a list of these Shell Cordovan models to help with identification of them. The list is not complete but it does contain the most common Shell Cordovan model that you’ll find on eBay. 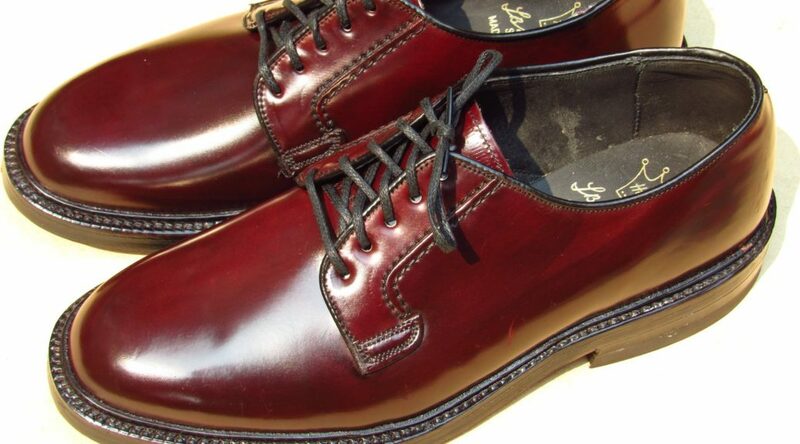 After Florsheim, Hanover is the most common vintage Shell Cordovan brand. The model identifier for Hanover shoes is a four-digit number. In the image below, 2168 is the model number. Early Shell Cordovan models were labelled “Imperial”. In the late 1960s(? ), the “LB Sheppard Signatures” label was introduced as Hanover’s premium line of shoes. The LB Sheppard line appears to have ended in the 1980s and “Masterflex” or “Masterflex Signature” was used instead. I have seen both rubber and leather heels on the same model. Some Hanover outsoles are labelled with “Shell Cordovan” while other soles are not. A few of the brown models below came in Ravello Shell Cordovan. Notes: Black version of the 2168 The stitching is different than the 3150. See more details on this model. Thanks, some of those created additional style numbers to the Horween shell list of shoes found on the internet. Now, If I can just find some for me! any comment about the 2366 model? I am eyeing a pair of wing-tips that I want to learn more about. The 2366 is a corrected leather long wing. Its okay but Hanover made better models. Are the masterflex 2356’s also corrected leather? Just picked up a good looking pair for $5 from Goodwill and they are in my size, so I’m happy regardless. Any comment about the 3350 model? 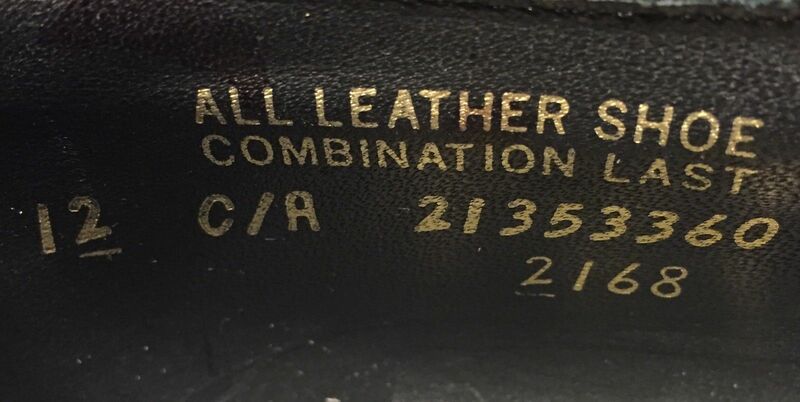 I own a pair of Hanover, A man’s shoe, saddle shoes, model 2182, SN17332016, that are unusual. First, They are black/red and second, the markings on the sole make me believe the shell cordovan is from someone other than Horween. The bottom sole on one shoe is stamped with a horse and jockey galloping, legs spread, and long whip over head. It also contains the letters “F. D.” above the horse and “D C” below. Can you help me out? Where can I find additional information? Thanks. Are you sure they are shell? The ones I have seen are not. You can always send me a photo. I believe “F.D.” indicates they are seconds. Like Allen Edmonds seconds, the defect could be very minor. Can you tell anything about these ones? Those are shell cordovan. Some of the Hanover shell models used what appears to be Ravello shell. Thank you, for a non-expert, anything wrong with Ravello? What about 2103 models. Are they shell? what do you mean correct leather? Can you take a look at these and see tell me if it’s worth it? Hey – do we know about 2166? I recently bought my first Hanover LB Sheppard from the Bay, a #2100 saddle. The size is marked as 10.5 C/B. I thought it unusual that the heel has a one size drop from the ball width, instead of the usual two. I have seen a number of pre-1960s pairs with a one width difference in the heel. Its surprising when you find one. Maybe it was an option at one point. Thanks for such an informative site. Your vast knowledge never fails to impress. David; thank you again for all the help and advice; any info on model 2313? I’ve seen, at least what appears to be, a 6 eyelet black shell… Has anyone else seen this before? Model 2503 and mention ‘CORDO’ on the box. Do you happen to know If the master flex 2101 is corrected grain or shell? The 2101 is in the 1970 Hanover catalog that I posted. Its calfskin. They must have reused the model number in later years. The shoes I’m looking at are brogued and closed-laced, not PTBs. They are also post-LB Sheppard branding. I have a few catalogs from Hanover from the 1970s and 1980s and I don’t see that version of the model. The pair doesn’t appear to have any creases so they look like Shell to me.